At this weblog devoted to life in Israel, it's appropriate to note the passing of Robert F. Drinan, a Jesuit priest who died Jan. 28 at age 86 in Washington, D.C. He was a friend of Israel and the Jewish people. Drinan's obituaries have emphasized other aspects of his extraordinary career. In 1970, Drinan became the first priest elected as a voting member of the U.S. Congress. He is remembered as an early critic of the U.S. war in Vietnam, and as the first member of Congress to file a resolution calling for the impeachment of President Richard M. Nixon. Almost none of the media coverage after his death mentioned that he was a leading voice in the human-rights campaign on behalf of Jews in the former Soviet Union. In 1972 he co-founded the National Interreligious Task Force on Soviet Jewry. He chaired an international committee for the release of Natan (then Anatoly) Sharansky. Drinan also served on the advisory board of the activist Union of Councils for Soviet Jews. This was a self-styled "grassroots" movement that favored direct action over the cautious approach taken by the Jewish establishment. This group which Drinan chose to support could be described as militant, in the meaning which "militant" had before it became a post-9/11 euphemism for violence and terror. Also generally unmentioned in Drinan's obituaries is his 1997 book, Honor The Promise: America’s Commitment to Israel. The journal Foreign Affairs described it as a "passionate pro-Zionist essay by the Massachusetts Congressman and Catholic priest. Father Drinan argues that anti-Semitism has been transformed in the Third World and the United Nations into anti-Zionism." Drinan took stands on principle, at times in conflict with the teachings of his church. He opposed constitutional amendments to outlaw abortion and permit prayer in public schools. He once called himself a "moral architect" who helped shape policy. Critics referred to him as "the mad monk." Drinan won five elections for Congress. He was undefeated until Pope John Paul II ordered him in 1980 to abandon politics or give up the priesthood. After Drinan announced that he would be leaving Congress, "with regret and pain," friends in the Washington Jewish community organized a simple luncheon in his honor. Genuine affection filled the room. It was not a happy farewell. The speaker from the Jewish community had tears in his eyes. On leaving Congress, Drinan returned to academic life. He taught human rights, legal ethics and constitutional law at Georgetown University. He continued to write books. 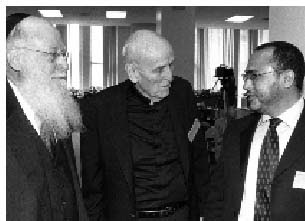 From left: Professor J. David Bleich of Yeshiva University's law school, Father Drinan, and Dr. Khaled Abou El Fadl of UCLA School of Law, at a program on "Tolerance from the Religious Perspective." Colman McCarthy, director of the Center for Teaching Peace, wrote in The Washington Post that Drinan "saved his most fiery writing for the National Catholic Reporter, the progressive weekly to which he contributed a regular column." "John Paul II has demonstrated more understanding for the Jewish community than any pope in history. He has seldom, if ever, publicly recalled his personal reactions to what happened [in the Holocaust]. But he has recognized the state of Israel after all his predecessors, going back to 1948, refused to do so. He has tried to implement the Vatican II decree on Christian-Jewish relations published in 1965. He has taken several other initiatives. "But at the end of his pontificate, the residue of anti-Semitism, accumulated in centuries of disdain for Jews by Christians, still remains. It is sometimes not directly articulated, but expressed covertly. It is a sort of ethnic, tribal, class animosity that is more a vaguely inherited bias or prejudice, transmitted silently by an unseen, unspoken and odorless feeling." Drinan wrote that those words "are still painfully true." The Georgetown University Law Center has set up an electronic memorial for remembrances of Father Drinan. Copyright - Original materials copyright (c) by the authors. Originally posted at http://israel-like-this-as-if.blogspot.com/2007/02/robert-f-drinan-1920-2007.html. Please do link to these articles, quote from them and forward them by email to friends with this notice. Other uses require written permission of the author.